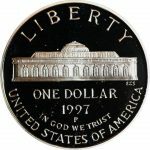 1997 U.S. Botanical Garden Proof Silver Dollar Commemorative. The Obverse shows a view of the primary garden building. The reverse is adorned with a Rose in the center and border composed of five Roses. The words “United States Botanical Garden 1820-1995 appear. Complete with certificate of authenticity and box.